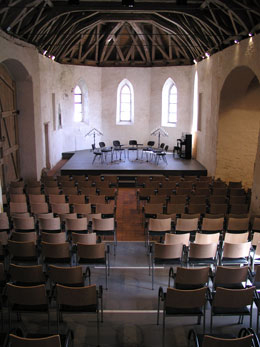 The historically rich old church (Alte Pfarr) with its exposed late Gothic roof timbering and is today after an eventful history an atmospheric hall for performances. It’s clear architecture is convincing. In 1275 this sacred building was first mentioned and until the beginning of the 19 the century it served as parish church for the community of Wolfegg. Remains of a one aisled church with typically 12 century romanesque apse were discovered during archaeological excavations. In the 14th century the south wall of the church received a mural art decoration showing the burial and the Lamentation of Christ. In 1808 the Old Church was used for secular purposes and degraded to an agricultural barn. This dismal period ended in 1982 with the restoration of the Old Church.